Nyhan and Reifler showed through psychological research that information presented in graphical form is much more compelling than textual delivery. Obviously, misinformation can likewise be better achieved by using misleading graphs. Graphs can deliver much more than text. "A picture is worth a thousand words" is certainly an old adage. Still, images are truly powerful. These can inform but slanted in a certain way, these could also misinform. “In Mindanao, especially in areas frequently affected by conflict, our agency cannot control conflict but this is one of the major reasons why they are dropping out,” Mateo said. Dino said migration or change of residence, malnutrition, sickness and the distance between the school and the students’ homes also play a role. Right in the middle of "excuses" is a figure. 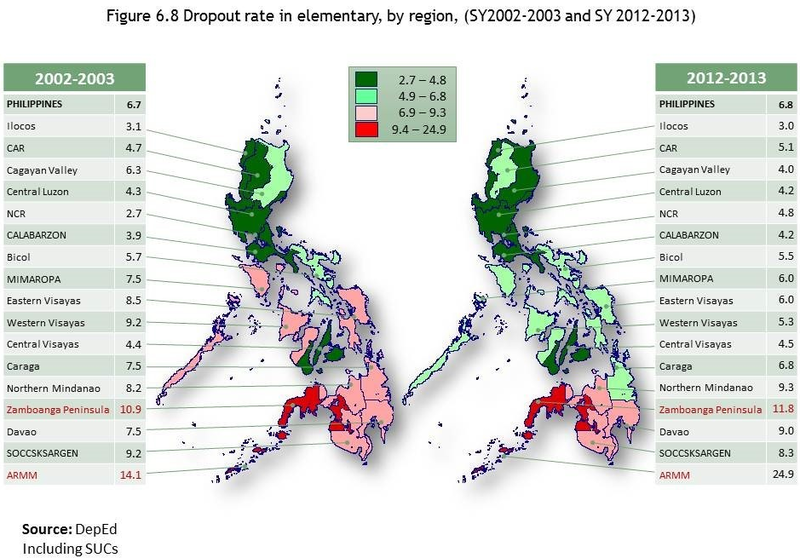 The above figure which shows the map of the Philippines aims to compare dropout rates by region in two time periods, 2002 and 2012. The assigned ranges for the colors are truly arbitrary. Why does the dark green stop at 4.8, for example? Of course, with the above choice, the 2012 map looks more green than the 2002 map. This is obviously a deception because the dropout rates for the entire country are almost identical for the two time periods (6.7 in 2002 versus 6.8 in 2012). Quoting dropout rates in fact already hides the truth since the percentages may look the same, but in terms of absolute numbers, these could in fact be very different. There are about 12 million elementary pupils in 2002. In 2012, the number has increased to 13 million. 6.7 percent of 12 million is 804,000. 6.8 percent of 13 million is 884,000. While the dropout rates hide the increase, by looking at the absolute numbers, the number of dropouts has in fact increased by 10 percent. There are 80,000 more dropouts from elementary in 2012. 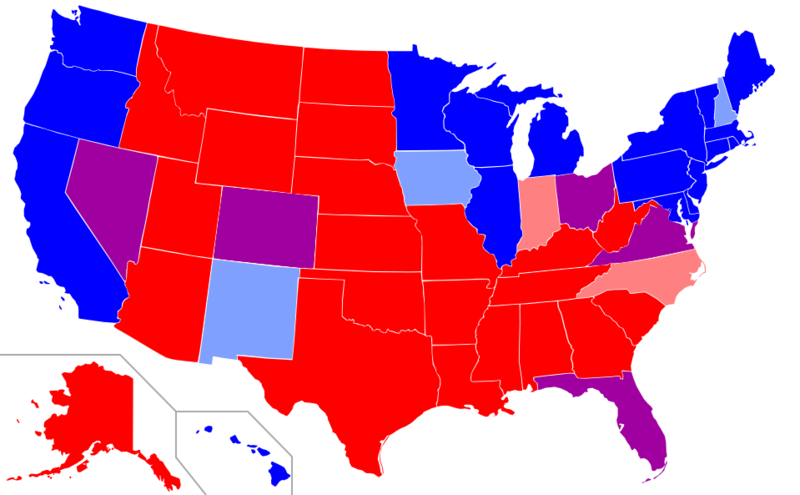 At first glance, the map gives the wrong impression that the United States is overwhelmingly "red", which is very far from the truth. Maps do not do justice to population density. Maps only show land area and not the number of people actually residing in that area. Similarly, returning to DepEd's map of dropouts, one should not use a map to convey such information since the map does not carry the density dimension. For instance, in 2002, the regions NCR (National Capital Region) and Calabarzon account for 20% of students enrolled in elementary schools. NCR and Calabarzon combined cover only 5% of the land area of the Philippines. 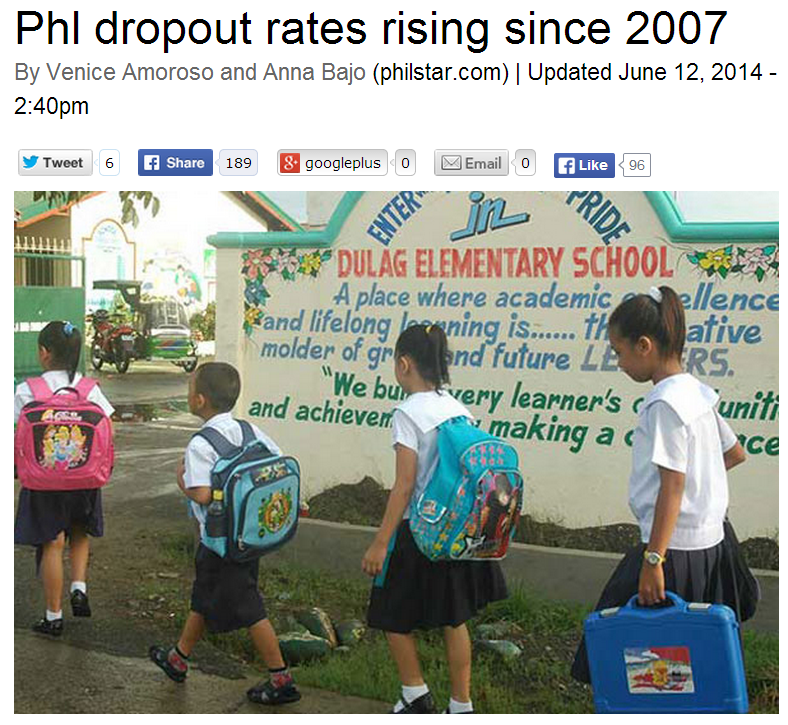 The dropout rates in NCR rose significantly from 2.7% in 2002 to 4.8% in 2012. This has also risen in Calabarzon, 3.9 to 4.2. What is alarming is that in both populous regions, the dropout rates are below the national average. Things could therefore get worse. These are regions that lie very close to the seats of power yet the schools' performance in these areas are deteriorating. These are places where DepEd is closer yet excuses such as distractions, disasters and conflict are given.